Extremely rare Rolex 6611b daydate with Rolex factory original white laquer/enamel dial. 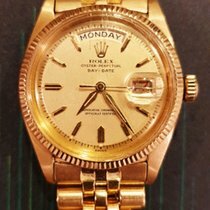 It is also fitted with a very rare heavy mesh factory Rolex band in 18k yellow gold. It has the big logo Rolex buckle dated 1959 and is original to the watch!! Due to band wear between the endpieces you can only read the last 2-3 #s of the serial #. The dial was authenticated as original Factory Rolex by Phillips international head of watches, Sam Hines.